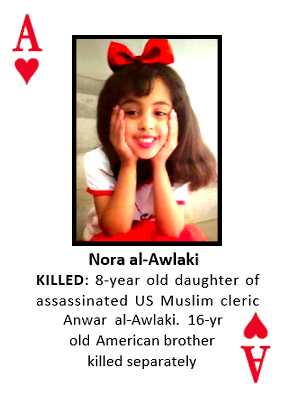 The first combat death for the new US Government came in an engagement which killed an 8-year old girl. Obama's government assassinated the father & his 16-yr old son. Both were U.S. citizens targeted without trial. Trump's first combat mission (on his 10th day as President) now kills the daughter. But assassination is not an acceptable substitute policy, and all the more terrible when it targets family members. President Trump declared we must kill the families of America's enemies, but surely that's illegal under international law, and shortsighted policy (we should hope to avoid reciprocal targeting of American leaders' families).